"It's no good, Jamie, they can't hear!... What have we done?" The soldiers have discovered the Doctor was at Charring Cross. 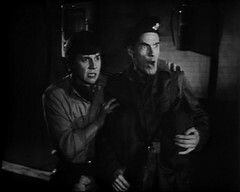 Captain Knight dispatches Staff Sergeant Arnold to find him. Weams reports that blast recorder has measured no damage. Word comes in that there is trouble at Holborn and Jamie, to his alarm, overhears the word Yeti. On the phone line gunfire is heard and a roar before the line goes dead. Knight takes a team of soldiers to Holborn to see what's happened. 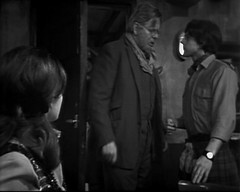 Arnold & Blake find the destroyed explosive boxes under the Yeti's web: both suspect the Doctor of interference. Travers is reunited with Jamie and Victoria, vouching for them to the soldiers. Arnold returns, sure that the Doctor has sabotaged the explosion. Jamie, insisting that the Doctor didn't do it, says he suspects he knows where the Doctor can be found. The journalist, Chorley, is suspicious of the Doctor & his friends as well. 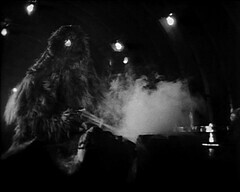 Falling back from Holborn Knight's party have been engaged by Yeti, with several soldiers killed by the web guns. 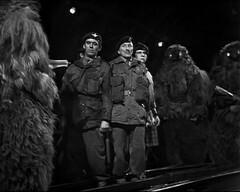 They attempt to build a barricade, packed with explosives which they detonate but the Yeti are unharmed. 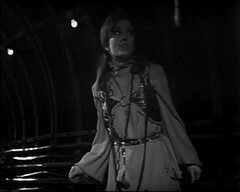 Victoria overhears Ann Travers accusing the Doctor of being responsible for the Yeti and leaves the fortress to find him, not hearing Professor Travers robust denial and defence of his old friend. 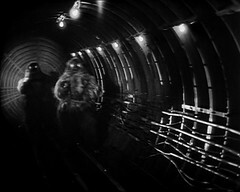 Arnold & Jamie have met Knight & Lane in the tunnels but all are captured by Yeti. 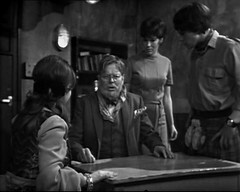 Blake & Weams speculate about the origins of the Yeti, with the Doctor being accused of responsibility again. The illuminated underground map on the shelter wall suddenly starts to shows the Yeti's web fungus advancing round the circle line at both the top and bottom of the loop. Travers is informed and is astonished at the rate of progress. 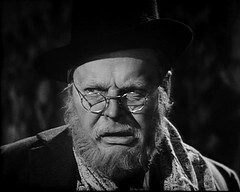 Chorley suggests the Doctor's responsible. Victoria has become lost in the tunnels. Meanwhile the Yeti guarding Jamie and the soldiers suddenly are summoned away and walk off abandoning their prisoners. 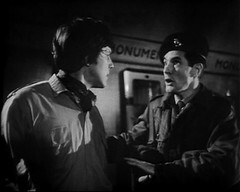 They hear a welsh voice singing in the tunnels and meet Evans, the driver on the ammunition truck. He has seen the web advancing following a Yeti holding a pyramid. Remembering how the Pyramids helped the Intelligence maintain it's earthbound presence in Tibet, Jamie leaves with Evans to destroy the pyramid. Evans meanwhile intends to do a runner at the earliest opportunity. They proceed to Cannon Street and onwards to Monument. Chorley wants to evacuate the base. 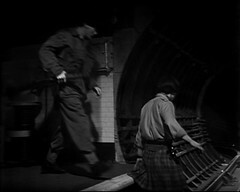 Knight and Arnold return to base with no news: all three of the time travellers are now missing in the tunnels. An unknown soldier stalks Victoria in the tunnels. Jamie and Evans hear a noise, then see a light: the Fungus is advancing down the tunnel towards them! 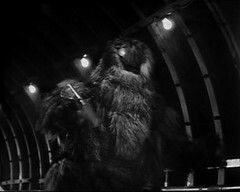 This episode, with it's battle with the Yeti in the tunnels sounds superb. Like Abominable Snowmen we've got an early episode existing so we've got a decent idea of what everything looks like, helped here by (if you're a Londoner) familiarity with the location. When Haisman and Lincoln last did a Doctor Who story they had accusations being flung at the Doctor that he's responsible for the alien menace. The same trick is used again here. Last time suspicion passed round the cast when we knew who was responsible: this time it's slightly different. Patrick Troughton's on holiday this week but unlike Evil of the Daleks 4, where all his material was pre filmed, he doesn't appear at all. 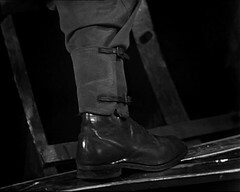 Similarly the Army boots seen in the tunnel towards the end aren't filled with their usual owner but instead are occupied by by extra Maurice Brooks, saving the cost of hiring the actor in question for a cameo scene. The main setting for this story is the Deep Level Shelter at Goodge Street Tube Station. Constructed at various points along the Northern line these shelters exist bellow the level of the tube stations to offer a good level of protection in the event of an air raid. People had been sheltering in Tube stations since the start of WWII, indeed Churchill used the disused Down Street Tube Station as a shelter. If you watch the James Bond film, Die Another Day, the fictional Vauxhall Cross station Vauxhall Cross Tube Station shown in the film occupies the space where Down Street would be on the Pica dilly Line map. For more information on deep level shelters see http://underground-history.co.uk/shelters.php. Ten years later the Camden Town deep level shelter would be used in a location during Doctor Who: The Sunmakers. 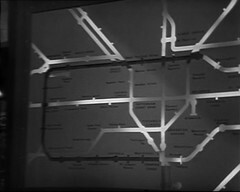 The London Underground Tube Map features prominently in this and subsequent episode, particularly in the form of an illuminated version on the wall of the Goodge Street Fortress showing the progress of the web fungus. The tube map is a piece of iconic design created by draftsman Harry Beck that's become an icon of London in it's own right and a template for public transport maps everywhere. Mr. Beck's Underground Map is a great read on the development of this important document. The map at Goodge Street helps us date this story: No Victoria line is shown so it's prior to 1st September 1968 when the branch from Walthamstow Central to Highbury & Islington in North London opened. Likewise the Jubilee line, opened 11 years later in 1979 is also missing from the map. 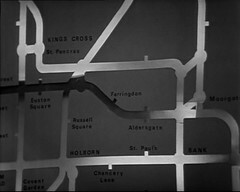 There's three branches present that are missing from the map now: The Piccadilly line spur from Holborn to Aldwych and the Central line from Epping to Ongar railway station have ceased operation while the Northern City Line, which you can see to the right of the second picture of the map, from Moorgate to Finsbury Park is now operated by National Rail. 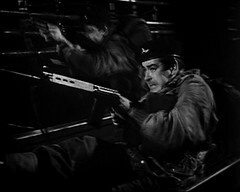 This week's randomly credited soldier is played by Joseph O'Connell. 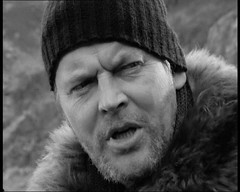 He'd been in Z-Cars: The Great Fur Robbery Part 2 the previous year. 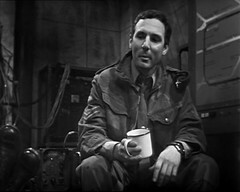 The episode is one of 3 to feature episode 1's soldier, Bernard G. High, as Detective Constable John and was directed by this story's director Douglas Camfield. 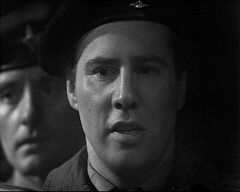 The likelihood is he plays the soldier with Knight in the Tunnel named as Thompson in the script. There's another soldier here, O'Brien, who's Rifle jams and gets mown down by a Yeti and another, Cooksey, is killed in the same battle. The so called "Omni Rumour" of impending episode returns swept fandom during 2013 - I've written about it before here and here. The rumours varied from telling to telling with anything up to 96 episodes returned. The most popular variant was the "MEW" version: Marco Polo, Enemy of the World and Web of Fear. And out of all these the one that really thrilled me was the possibility of seeing more of Web of Fear. These rumours rumbled on and on until on October 6th the Sunday People, a national newspaper, ran a story about missing episodes on their website. At that point mainstream media really took an interest leading to this report on the BBC Website which all but confirmed the story to be true in some form! Thursday 10th October was an odd, odd day to be a Doctor Who fan. Debbie Watling's website had let slip the press conference was that day but a plan to Live Tweet it by The Daily Telegraph was scuppered by the news revealed being embargoed till midnight. I spent the day listening to my Web of Fear Soundtrack for what I hoped would be the last time and, like many who fans, glued to my PC in the hope of a leak from the press conference. And sure enough someone accidentally let the cat out the bag with Northern Echo posting the story on their website just after 6pm..... and removing it about thirty minutes later when they realised. 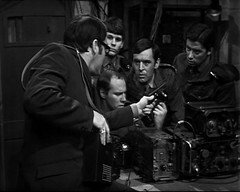 But by then the secret was out: All the missing episodes of Enemy of the World and four of the five missing episodes of The Web of Fear had been found and what's more they'd be on iTunes the next day! Given a choice between Enemy of the World and The Web of Fear, The Web Of Fear wins every time so I set out the next day to watch the story. Unfortunately real life had intervened and I needed to go out for the morning. How would I get to see the episodes? Simple, I took the iPad with so my first experience of the recovered episode 2 and the recon for episode 3 was watching them on the iPad on the bus! Oddly enough, just as I was starting episode 3, I had a text from my friend Ralph who was doing exactly the same thing with Enemy of the World! 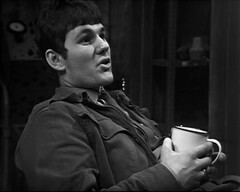 The were two scenes that really stood out for me in the episode watching it for the first time: One was Blake & Weams chatting to each other over tea, it just looked so natural. Two Pals having a chat. WEAMS: Tibet? Tibet? You're joking. BLAKE: That's where old Travers says they come from. He reckons they're Abominable Snowmen. WEAMS: Well, he's off his chump, ain't he? How'd they get here in the first place? BLAKE: Come through the post, don't they? WEAMS: Nah, seriously. Outer space, that's where they come from. Well, that's what I reckon, anyway. BLAKE: Oh do leave off. You've been reading too many kids' comics, you have. WEAMS: All right then, Corp, where do they come from? BLAKE: It's a foreign power, ain't it? Bacteriological warfare, that's what that stuff is in the tunnels. WEAMS: What, that fungus stuff? BLAKE: Yeah. And them Yeti are some sort of new weapon. Well, a sort of robot army. WEAMS: What, you mean it ain't real then? BLAKE: Well of course they ain't, you nit! Otherwise we'd be able to knock 'em out with the small arms, wouldn't we? WEAMS: Yeah. Nothing hardly touches them, does it? BLAKE: Not unless you can cop 'em straight between the eyes. Then they've had it. WEAMS: Yeah, well that'll take some doing. I mean, I'd have a job just holding me arm steady if one of them ugly creeps came at me, wouldn't I? BLAKE: Yeah. I wish we had some more hand grenades, cus they're the things that seem to stop them dead in their tracks. WEAMS: Yeah, but we ain't got any, have we? BLAKE: It's a pity that ammo truck they stopped at Holborn had all the gear in. WEAMS: Stone me! Here, we ain't got much of a chance if we come up against that lot, have we. BLAKE: Not with the funny old crowd we got down here with us. You got civvies, RE's, REME. WEAMS: Here, watch it, mate. BLAKE: The lot. A right old Fred Karno's Army, innit? Still, not to worry, me old son. Not the end of the world, is it. Want some more tea? WEAMS: Yeah, all right mate. WEAMS: Here, Corp, look at this. BLAKE: What? Oh, crikey. That's what comes of talking about it. WEAMS: It's that fungus stuff, it's moving again. While they're talking Blake describes the group in the fortress as "A right Fred Karno's army" a reference I've never got and never thought to look up till now. Fred Karno was a music hall impresario in the late 19th and early 20th century who employed a group of comedians - among them Stan Laurel and Charlie Chaplin - as part of a group known as Fred Karno's Army, a term which became used as slang for "a chaotic organisation". Karno had the Astoria Houseboat, no doubt named after the theatre, constructed in 1911. It's now used as a recording studio by the Pink Floyd musician David Gilmour. As for those he describes as being in Fred Karno's Army I'd never given it much thought until my Father in Law talked about his national service days. REs are Royal Engineers and REMEs are Royal Electrical and Mechanical Engineers, which is almost certainly the branch of the service Craftsman Weams hails from, hence his reaction! The other scene that really stands out was when Travers meets Jamie & Victoria again. TRAVERS: Well now, you've got some explaining to do, haven't you? JAMIE: We have? Now look here. TRAVERS: Now, now, just what do you know about the Yeti? TRAVERS: And the spheres? Where'd you find out about them? JAMIE: I'd like to ask you the same question. VICTORIA: Wait a minute, Jamie! I'm Victoria Waterfield. And that's Jamie McCrimmon! TRAVERS: But it can't be. Why, that's over forty years ago. JAMIE: What's going on here? VICTORIA: Oh Jamie, don't you recognise him? It's Professor Travers. JAMIE: So it is! Professor Travers! Here, hasn't he got old? Oh, but we're very pleased to see you, Professor. Very pleased. The picture concentrates on Victoria as the light slowly dawns in her eyes that this portly older man is the same Edward Travers they met two adventures back in Tibet. I've also noticed for the first time quite how intrusive Chorley's Microphone is, how he's constantly pressing it into everyone's faces as he's interviewing Victoria and then taping the battle at Holborn, much to Captain Knight's disgust! Likewise here's Jamie & Evans at The Monument and the actual station. 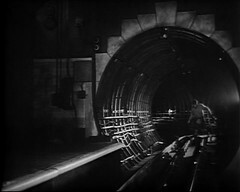 All stations on the District/Circle line are built using the Cut & Cover method which results in larger more open station areas with both tracks passing through between the platforms rather than those used for the deep level tunnel lines, where each track and it's platform are in their own tunnel, like the Northern line where most of this story's action takes place. Seeing Monument and Cannon street represented by the typical deep level station design is just wrong. On the deep level tube lines the design is broadly similar from station to station, which allows director Douglas Camfield to use the same set for all the stations with just the name signs redressed. 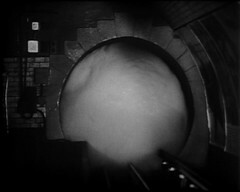 But a big HURRAH for the appearance of a Troughton stable, for the first time on moving pictures, at the end of this episode: The foam machine is here pumping foam into the station to represent the web!